Masks are used to apply blending and transparency effects to images and graphics. 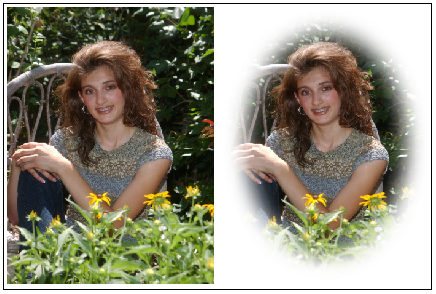 For example an image hole may have a mask added to it to soften the edges of the image thereby blending the edges into the background. Vignettes are one such example. The second image below has had a mask applied to achieve the vignetting effect. 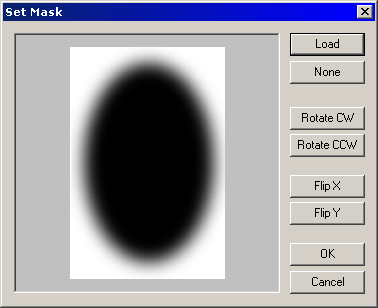 A mask is simply an 8-bit greyscale image file created in Photoshop (or equivalent) and saved as any of the standard image formats such as jpeg, png or tif. An area of the mask which is 100% black will be totally transparent. An area of the mask which is 100% white will be totally opaque. All shades of grey between full black and full white will convey various degrees of transparency. With the above rule in mind consider the mask used to achieve the vignette above. The centre portion of the mask is completely black and therefore 100%transparent. The image is completely visible in this area. Likewise the outside of the mask is completely white and therefore itopaques the image in this area. At the edges the mask blends from black to white via continuous shadesof grey. In this area the image is partially transparent. To apply a mask click the "Set Mask": button on the toolbar or use Image>Set Mask from the menu. The Set Mask window appears. To change a mask or remove it from the image hole, select the image hole in question then select the "Set Mask" function once more. Click the None button to remove the mask or the Load button to browse for another mask. The processing of images and graphics with masks is very demanding on system resources particularly RAM and CPU. As a consequence you may find printing products with masks slow. To alleviate this problem make sure the mask is a greyscale image not RGB. An RGB image is three times larger than its greyscale equivalent and is correspondingly slower to render. In addition masks do not need to be created at the full printing resolution. A resolution of 100dpi or even lower will usually suffice. Finally as with all printing, extra RAM on the printing computer will help.